It’s (temporarily) winter time in Houston! It’s a good/ridiculous twenty-odd degrees colder than it ought to be, and Day After Tomorrow kinds of cold all over the Northeast and the Midwest, so let’s talk about flaunting those cold weather clothes that normally hide in the closet like little fabric hermits! The high today is 34! Winter dun came already! Ok, so I know there are folks dealing with weather much more intense and disruptive, but they are totally allowed to stay inside, hopefully by a fireplace and/or space heater, all curled up with a quilt while wearing pajim-jams. (Also, it’s gorgeous, apparently.) For those of us forced to continue being exposed to wind chill, we’ve got to wear something, and it might as well be fabulous. So simple, elegant and timeless! Get the color you want and accessorize! There are seriously a million choices and styles. Go retro, super modern, or classic! Add fur (or faux fur), belts, buttons, asymmetry, a flared skirt; whatever your heart desires! One of these poofy jobs is great for rain and/or snow! Plus the necklines are way fun! If you don’t already have a coat, good grief I’m sorry, but it’s not too late to pick one up! If you’re on a serious budget, hit up the thrift stores near you! (The Salvation Army’s got half price clothing on Wednesdays and Saturdays!) Outerwear trends don’t change drastically, so you can almost certainly find something suitable. I was on the lookout for a trench coat, and found an awesome red one for $6! It has a super soft lining and everything! Originally, I wanted a gray one, and maybe someday that’ll happen, but clearly the universe had brighter plans. See?? What a fun twist on a classic coat! If it’s got a liner you can wear it almost any season, too! 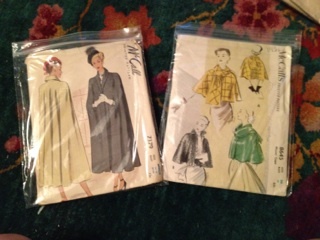 Here are a couple of retro cape patterns I have! They are so incredible! The fabric, style, and accent options are limitless. So, if you’re making a fabulous coat, shopping around, or revamping one you already own with fun scarves, hats and gloves, be sure you’re warm enough out there! Despite what those guys in shorts and t-shirts seem to think, being cold does not make you look like a badass. No one wants to walk around like Randy from A Christmas Story, but being miserable by choice is never a good look. (Btw, fellas, a man in a sweater and/or peacoat is a WIN every time.) Just dress for the season we’re in (or whatever “season” it happens to be outside), and you’ll look great, not ridiculous. Have fun with it! As we know all too well in Texas, it certainly won’t last long! Do you have a favorite winter ensemble? Do you have a go-to coat? Is it brightly colored?? Do you rotate accessories, or stick to just one scarf/hat/pair of gloves? Which is your favorite winter weather clothing item? ?